Boynton Beach-based Susan Allshouse is Florida's school tennis not-so-secret weapon. The USTA National faculty staff schools trainer is first on the scene when it comes to schools or Youth Tennis workshops, but her off-court involvement has especially helped the USTA Florida Section move forward in regard to the Youth Tennis format of play. "While the USTA has issued a call to action to win the hearts and minds of 6-10 year olds as part of an urgent imperative, this has been the thread throughout my volunteerism with USTA Florida," said Allshouse, a volunteer for more than 10 years. "I bring to my position as chair of the 10 and Under Tennis Committee a true love of the sport, and belief that it can play an important role in the life of any child and their lifelong development." As a USTA Florida Schools Specialist she helps facilitate programs and initiatives such as school facilitator workshops and Kids' Tennis Clubs. As a member of the national USTA Schools Committee she is the project team leader for the national schools e-newsletter, and shares best practices with other USTA sections. "I immediately 'Got on the Bus' with my first experience volunteering for the Region 6 (Palm Beaches-area) schools programs and seeing the difference we could make. After that, it's been, 'What can I do to help?'" Her committee and project involvement history is too lengthy to mention, but her current work includes membership in the national USTA Player Development Workshop Faculty, providing training to volunteers, parents, PE teachers, coaches and more to introduce tennis in an affordable and fun way; as a ROGY (Red, Orange, Green, Yellow ball progression) "Tourn-event" director and a Tennis Festival and Play Day organizer, providing play opportunities for children; and as a teaching pro and volunteer for East Coast Tennis Foundation, a USTA Community Tennis Association and member of the USTA NJTL (National Junior Tennis & Learning) Network. "Once we hook the kids, we must give them the chance to play or we will lose them," she says of new youth programs such as ROGY, Kids' Tennis Clubs and Team Tennis Challenges that focus on fun and match experience without the pressure of rankings. Last but not least, as a volunteer member of both the USTA Florida Board of Directors and the USTA Florida Section Foundation grant team, she assists in determining the strategic planning direction and grant-giving of the section. "As a member of the USTA Florida Section Foundation grant team, I have the opportunity to work with organizations and individuals to help make their dreams come true in their communities," she says. "I get to be part of a team of very special players who believe that if you dream it, you can achieve it. The rewards have been priceless." 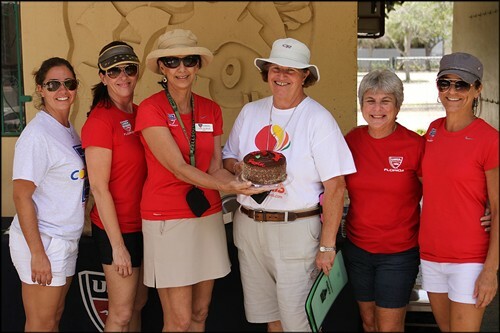 USTA Florida congratulates Susan Allshouse as the May 2014 Volunteer of the Month for her work with school tennis and beyond. My earliest tennis memory was..."First learning the game at the age of 18 by playing with my dad, and progressing quickly to competition, discovering that there is a right and wrong time to first beat your coach and thereafter your teaching pro employers." If I could play tennis with three people, they would be..."Evonne Goolagong, Billie Jean King and Kenny Rosewall." When I am not playing tennis I am..."Capturing wild moments one click at a time -- digital photography, a work in progress." My best tennis memory is..."In 2005, having the first experience of being a court leader for Arthur Ashe Kids' Day [at the US Open] and experiencing 30,000 kids on court." I like to volunteer in tennis because..."It creates smiles and laughter simply by sharing a love for a sport that has given me so much."